Is it just me, or does the purple cow resemble the Halo Burger cow? My family still calls Halo Burgers by the original name Kewpee's. I still remember my parents taking me downtown to the original one on Harrison Street. 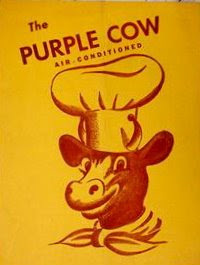 isn't/wasn't the purple cow the name of the cafe in Meijers? Yes, The Purple Cow was (is?) the name of the Meijer cafe. 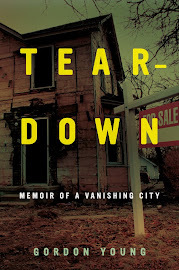 That place sustained many a bored Flint teen throughout the years. DrDoom - my dad still refers to Halo Burger as Kewpee too, on occasion. Confused the hell out of me when I was younger. . .
Kewpee was a franchise, so Bill Thomas had to pay a royalty (I think it was 5 cents) for every Kewpee wrapper he used to wrap his burgers in. After getting tired of paying the royalty Thomas changed the name to Halo Burger. Same great burger (the best you'll find anywhere) just a different name. If I remember right, the Vernors grill or cafe became Kewpees... Grandma took me to Vernors after the theaters let out and we had creme-ales and cherry cream-ales.... On the building across the little parking lot at the side of, then Kewpees, was an elaborate painting of little gnomes and lots of kegs depicting the making of Vernors. Wish I had had the sense to take photos way beck then! :D Vernors originated in Detroit. Carol, My grandmother used to take me to the Purple Cow in the Durant Hotel when I was just a little one (born in '43). I loved it and remember the paintings on the walls of purple cows dressed so fancy sitting at little cafe tables.... the writing on the wall said, I've never seen a purple cow, I never hope to see one. But I can tell you anyhow... I'd rather see than be one." My grandmother used to take me to the Purple Cow in the Durant Hotel in the 40's and 50's. I remember the huge crystal chandeliers, the bright paintings of fancy dressed cows sitting around cafe tables on the walls... and the writing said, "I've never seen a purple cow, I never hope to see one. But I can tell you anyhow, I'd rather see than be one." First poem I ever learned! Yes, yes! 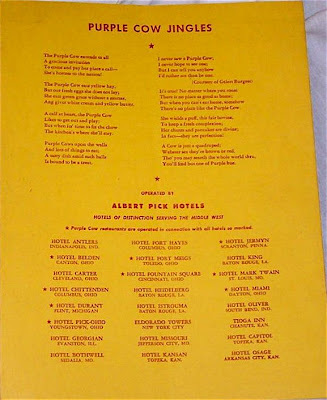 Now I see that the poems are on the last page of the menu! 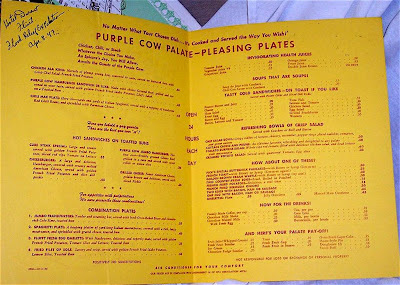 The Purple Cow was a common name of restaurants, with some variations, in Western Culture. When I studied German, our text referred to a restaurant called "Das Bunte Kuh" in Germany, as I recall, meaning The Colorful Cow.